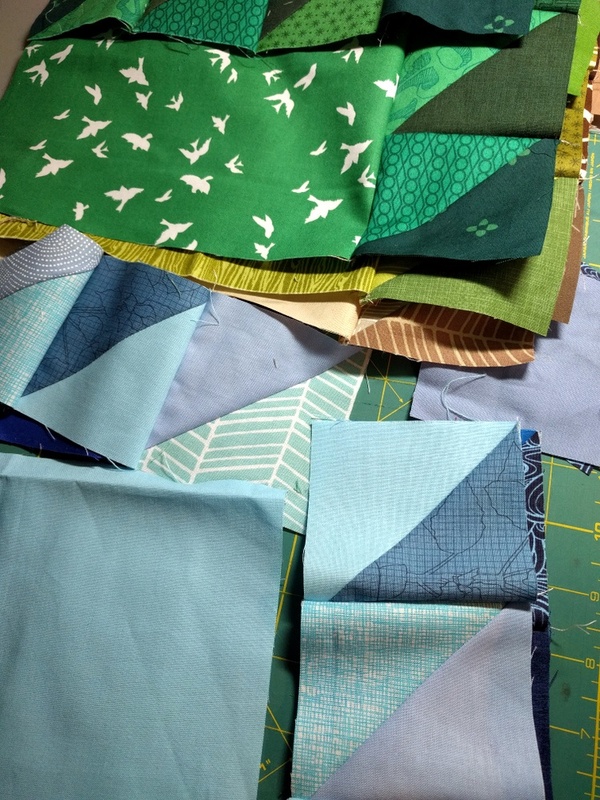 The best part of piecing a quilt, for me, is figuring out which fabrics go where. Sometimes it's a vague plan instead of a precise one; an element of improvisation is exciting. 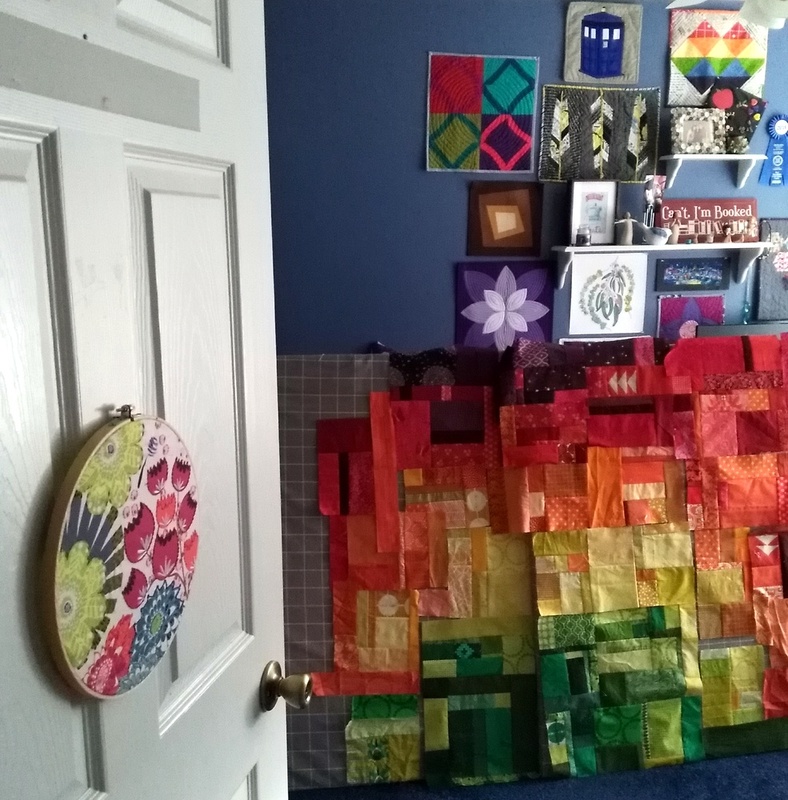 For example, when I made my fall landscape quilt, I pieced together blocks by color, not knowing exactly where they would end up. 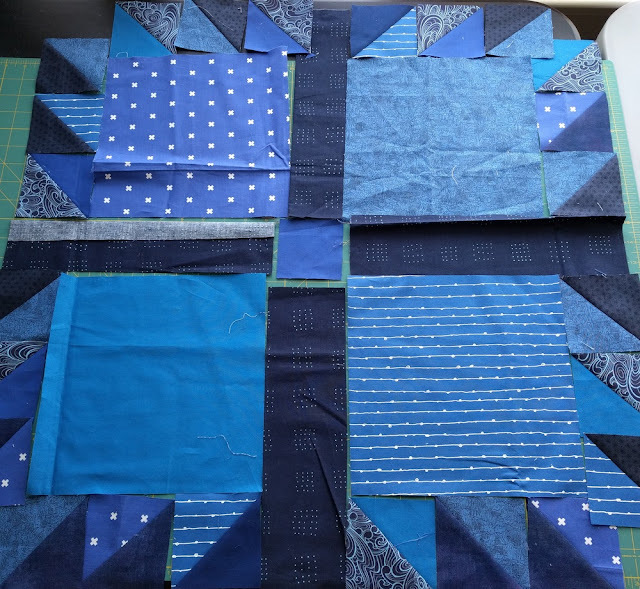 This year, I'm making one big quilt to give at Christmas (obviously I won't reveal the recipient just yet), and the design is 6 huge bear paw blocks (similar to my Star Light, Star Dark layout). 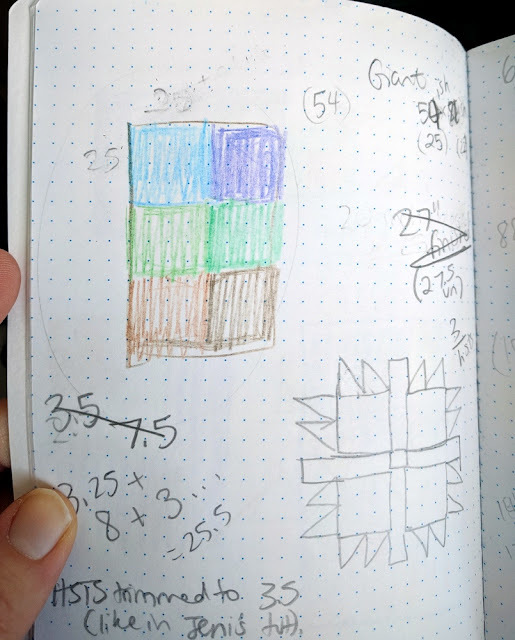 Big blocks are awesome, so I'm using this tutorial by Jeni Baker (why do the quilt math when you find what you need?). That's a lot of half square triangles! Going into this quilt, I needed to have contrasting values in brown, green, and blue - you can see my general plan above. The contrast in each block needs to be enough to let the bear paw design shine through. This took a lot of scavenging and planning within my scraps and fabric stash. Of course, scrappy quilts naturally breed more scraps... so I wouldn't say this was a scrap buster! Over the last couple of years, my fabric buying has shifted greatly. Not only am I buying much less than I used to; I'm also only buying colors or shades that I need for a project or gaping hole in my fabric stash. Recently, I realized that I've shied away from using fabrics with a white design on a saturated background and now prefer fabrics that are truly tone-on-tone (like, a darker red motif on a lighter red fabric). These fabrics best help me create original designs that showcase the design, not the fabric itself. Anyway, throughout the process of making this quilt so far, I came to a few roadblocks. First, I had to avoid any fabric with a lot of white in it. I realized that the white was overtaking my fabric choices (the contrast of the main colors is the main element of these blocks). The "x" fabric from Cotton + Steel and stringy white fabric (bottom right) by Karen Lewis Textiles were just the perfect amount of white for this block. The color doesn't overwhelm the overall design. Second, I simply did not have enough brown fabric. It's been really hard to find modern brown fabrics - saturated, not too dingy, dark, or muted, and featuring some kind of not-too-overpowering design. 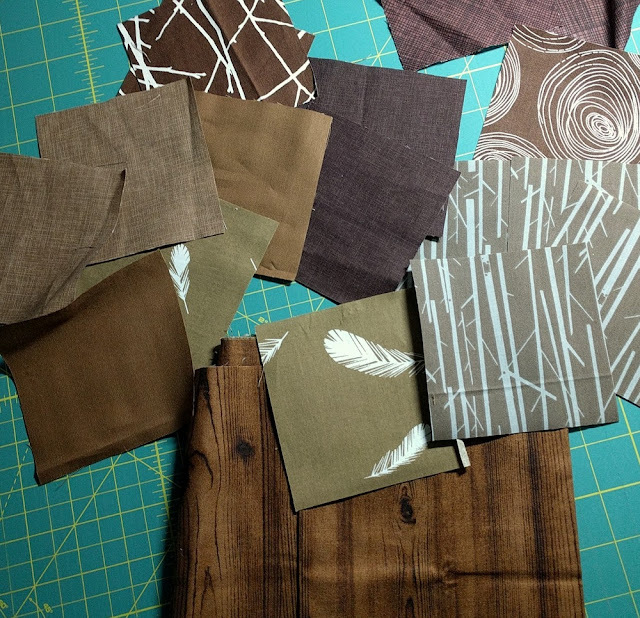 My dear guild friend Laura @drlbennett graciously offered up some woodgrain fabrics to mix into my brown blocks (after all, I want the bear paws to be scrappy). All in all, if you're looking for some special scraps to use, I would recommend talking to your guild mates or online buddies. Quilters are always willing to help out (especially with scraps, I've found!). Don't be afraid to cut into yardage, either. There's a reason you have that fabric, and it might just be to use a little piece (for now!). I'm excited to see how this quilt comes together! I totally agree with you about having trouble finding brown fabrics with a modern tilt - it seems like most modern fabric lines use navy or grey/black as their dark neutral and brown gets left out. I have found the same things about buying fabrics lately -- the vast majority of what I am buying for myself ends up being backings! I'm so glad you were able to get help filling out the browns you needed (and now I know what you are doing with them)! I agree that my fabric buying and use has shifted over the years, and I appreciate that you talked about that. My friend and guild member lives 1.25 miles away. We text constantly as we are sewing if you have this or that if we are almost running out of something. She popped over on Thanksgiving morning to raid my scraps of reds and yellows.